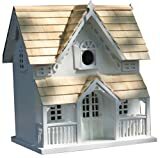 This winter, give your favorite feathered backyard friends a festive home of their own with this cool new Gingerbread Cottage Birdhouse. 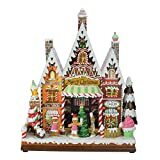 This whimsical cottage looks just like a real gingerbread house except it's made with plywood construction, red cedar shingles on the roof, and wooden candy and icing holiday accents all around it. It features a clean out panel, ventilation holes, drainage holes, a post mount, and a 1.25" opening to attract wrens, finches, chickadees, and other songbirds. It also makes a unique indoor Christmas decoration as well. If it wasn't filled with birds and made from wood, it would almost look good enough to eat.